The Wellness Oasis & Classroom are places to heal and study subjects that you’ve always wanted to experience and learn about. The workshops include hot topics of the moment and informational presentations for a healthy, grounded and successful community of enlivened beings. Whether you want to know what to pack in your herbal first aid kit, how to use cannabis for pain relief and healing, Feng Shui your surroundings, overcome money blocks, sing kirtan, breathe freely or quickly heal from a broken relationship, you will find a treasure trove of classes to choose from in the Wellness Classroom. 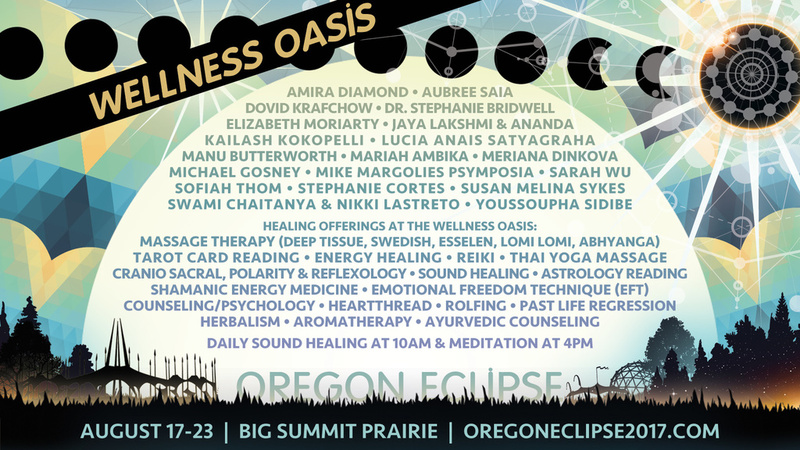 The Wellness Oasis will be holding space for healing and offering a wide range of modalities. You can choose from a Reiki session to a deep tissue massage. We’ll be offering Acupuncture, chiropractic adjustments, Thai massage and body-work, tarot card reading, Ayurvedic sessions, EFT and so much more! Qualified healers from all over the world will be available to share their knowledge and experience. This is the place to try something new and a little different. Daily Sound Healing at 10AM, Meditation at 4PM and a whole lot of love in between!